Homes for Good are proud to present to the rental market, this ground floor one bedroom property. The property offers a large living with adjoining kitchen area with white goods. The double bedroom is located to the rear and a family bathroom with bath and shower completes the property. The property is provided unfurnished and freshly decorated throughout with neutral colours and finishes. 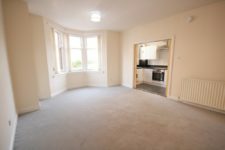 The property offers a great location and is within walking distance to all local amenities, ten minutes walk to Partick train and subway station and minutes from local bus routes. The property benefits from private parking space within the basement garage – which is a great feature in this busy area. More photos to follow once works are carried out. EPC rating: C. Landlord Registration Number: Pending. Letting Agent Registration Number: LARN1902070.